Admit it, we’ve all seen the worst of the worst at Networking Events. The “business owners” who show up every week and complain about how they don’t get anything from their said networking group anymore. I have to admit I hear this from at least 2-3 business owners on a weekly basis in groups outside my direct networking group. After really taking a few steps back and seeing how some business owners came to “play the game” I have decided that there was a definite void in the Networking Manual for business owners. Oh what? They don’t have one? Well then in that case, settle in because I am about to make one. I figure if we are going to go big let’s just go straight for the jugular here. If you want to be taken seriously then you have to look like you deserve to be taken seriously. You just walked into a sea of business owners. Not just any business owners but “networking” business owners. What is the idea when you go to a networking event? Well to STAND OUT of course. So how do you do that? You need to create a lasting impression among the group. This is where you would insert “Sunday best” attire and walk in like you own the place. This is the time where you have to have your game face on. Ditch the jeans. I mean it. Unless your profession is a professional landscaper, jean consultant, or even I’ll go as far as comfort analysist (which side note does anyone really own a pair of comfortable jeans, I normally am trying to squish into mine so comfort is never an option). Take a step out of the jeans and into a nice pair of slacks, even some women can rock a nice pair of leggings, but the point here is people value the fact that you took the time to dress the part. Invest in a Name Tag. I can’t tell you the amount of compliments I get on my custom name badge that cost me 15.00 at Office Depot. The point here is that I was prepared and it meant enough to me to put together prior to going into a Networking meeting. If you wear the name tag people will remember your name easier and also see it as another way to “brand” you. *Specifically for Women*. If you don’t have time to throw on some makeup and put your hair together I am going to be a bit bold here and say maybe skip the Networking Event in question for that day? *gasp* *shock* *horror*. The truth is whether we like it or not, we are looked at how we put ourselves out there. By not applying makeup correctly or not doing our hair it shoes we don’t care. So how could we expect someone else to? Feel me? This is probably the easiest to lose site of. Imagine you walk into a room filled with 70+ people all fighting for your attention. IT IS AN ABSOLUTE WAR ZONE. Then it’s on. Game Time. I walk in to absolute amazing coordinated chaos. At times I find myself saying hello to friendly faces and knowing that I “need to get back to them” but then before I know it I am whisked away to something else. This is a major problem. I lost sight of why I was there. I am there to Network. More importantly I am there to Pay Attention. I am there to look a fellow business owner in the eyes and learn about them. This is and will never be about me. It is and will always be about them. So as I continue to learn this process here are a few things I have picked up that have helped along the way in Paying Attention. Look them in the eyes– Really look at them. 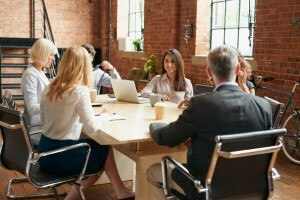 Take a mental picture of their name, their logo if on their name tag, and find one thing out about them that connects you. Don’t give all your attention to one person– try to incorporate 2-3 business owners in a conversation. This will allow you to collectively get to know each other as a group and allow for more conversation. Introduce people who don’t know each other and it will also help you get to know the individuals better. Know when to walk away– this is a hard one. When you see a conversation becoming negative, about the networking group itself, or even just distracting… walk away. You are not providing value any longer when you can’t adequately pay attention to the individual requesting your attention. If you have ever been to my Networking Group (SABRE link here) you will notice that my one most giant pet peeve of all time is someone who passes a clip board around to collect email addresses of everyone in attendance. Nothing will get you on my bad side more than this. We are there to collect relationships not emails. Focus on meeting people that you connect with on a business level or even on a personal level do a trade of the good ole business card and keep in touch. You won’t get to meet everyone at one event (promise) but focus on meeting about 3-5 good ones and then go from there. However, by going in with the expectation to collect as many business cards as possible you will never ever win. This is can also promise. You will also be slowly dissed on by the popular networking click (oh yes these exist). Once you get dissed… good luck getting back in. Whether professional networkers want to admit it or not… there is always a point person in any networking meeting you go to. The one person who knows everyone, has the smiling face at the door, and whose main agenda is to help you meet other people. Find this person. Example: My person in my networking group that does this is Cecilia Schreiber. She is a Melaluca consultant and she is the end all be all of smiles. You want to know Cecilia. Why? Because she is the Connector. The Connector is the one who places people together. She finds the void and fills the need. This is where paying attention comes into play. They won’t be wearing a flashing button here folks… you need to just pay attention and see the person who seems to know everyone and that people naturally gravitate to. That person is your in. Meet them, love them, and befriend them. Don’t be late – like ever. Even if it’s ok to be on your cell phone- keep it to a minimal, people notice, and unless you are taking notes on your iphone 6 (been there and I get this) it’s just not appropriate to spend a meeting on your cell phone texting. Respect the time allotted to you. Ok folks normally I wouldn’t be so brazen here but being that I need to get this point across to all networkers across the country I am going to have to go here. 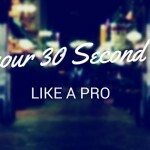 If you are allotted 60 seconds for a commercial. If you go over your 60 seconds and don’t stop when the buzzer goes off this tells me 2 things 1. You don’t respect my time as a business owner 2. You’re rude. That about covers it. Don’t do it. If asked to use a microphone or to conform with the group- do it. You ain’t special sunshine. You notice how I didn’t say mile here? Well to be honest that is mostly because most of the time just a little effort goes a long way. The Sign in table. 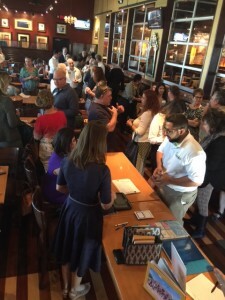 At the beginning of a networking meeting it can tend to be a bit nuts and an extra set of hands at the “check in “ table is always a nice touch. We are fortunate in that we have an extreme love for social media in our group. If your group is lacking this maybe take the initiative and get something moving along. Do you notice a new person? Make it your mission to go and introduce yourself. This helps leaders in the group feel like their group is being coddled by it’s members. Plus great bonus for you in that you met one new person that day. I am a culprit of this more time than not. However, at the end of the day you are there to grow your business. By sitting with your crew (you know who you are) you are limiting yourself and your business exposure to meeting new people. I promise they will still love you if you share loving glances from across the room at each other, but will appreciate you much more for pushing them out of their comfort zone to meet new people. “Hi I’m Erin I am an insurance agent, what do you do”. BLAH I just lost them because I said the forbidden word…. Insurance. Notice how I didn’t mention one time what I did or what they did. Again, key here is relationships. Build them. They don’t grow themselves, you need to plant the seeds to establish the roots. I won’t get into this too much and kindly refer to the master of your 30 second commercial, Kristen Barnes, in her most recent blog article. However, I will say the impact of your 30 second commercial is so crucial that by not having one that delivers a call to action you are basically giving your audience permission to not send you business. Networking doesn’t happen overnight. You need to put in the time to the group in order to get the return. You need to show up weekly, because that is when the magic happens. You need to show up enough to where you have to stop introducing yourself. Networking is a slow burn. You need to invest in things like your commercial, the One on One appointments you set outside of networking (everyone point at me and laugh on this one because I am the worst at making time for these), and most importantly you need to invest in other people. Networking is not about you. Wait what? Yes let’s say it together. It is not about you. This is the gladiator arena where you show up and fight against dozens and sometimes over a hundred business owners to be better than the others and stand out. Well how do you accomplish that to the best of your ability? Start caring about other people. People gravitate towards people who are eager to help them. Trust me I spend most of my weeks helping other business owners for FREE about throwing things up against the wall and seeing if they stick. I get passionate because they are passionate. Let that sink in for a minute. My business is my baby, SABRE (mine and my partners networking group) is my baby, and my passion for helping others is something that runs deep. So walking away from a networking meeting you should truthfully only feel one thing. Potential that you just met people who are not just business owners but are entrepreneurs just like you. Link up with people who speak to you. Admit it, that chick with the microphone talking about passion behind niche marketing (yeah that’d be me) peaked your ears up, go out of your zone and get to know her. Who knows she might be able to light a fire you didn’t know was in there? Or maybe you prefer to work with a “Chief Problem Solver” like my good friend, either way… successful people link up. They build relationships, and friendships, and they fight the standard networking models together. 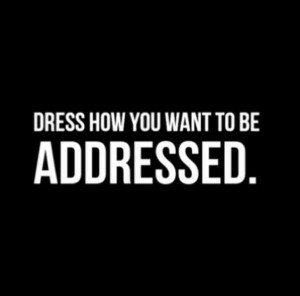 So get in there, dress the part and remember consistence and perception are in every single moment when it comes to networking. People will notice, people will care, and you will grow your business by building relationships.